If you are planning your holidays to Mallorca [also known as Majorca] the following information may help by giving you an overview on the island. Mallorca is located off the east coast of Spain and is one of the 4 Balearic Islands. Why not hire a car on your holiday in Mallorca? It’s a very small island and hiring a car for a few days will enable you to see most of it. Mallorca, or Majorca, is the largest of Spain’s Balearic Islands [its name comes from the Latin insular major, “larger island”. 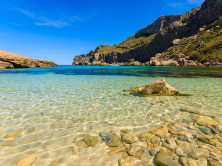 Today, Mallorca holidays are very popular due to the assurance of fine summer weather and good beaches, plus the fact that a wide range of accommodation, food, entertainment and leisure facilities are available at competitive prices. Palma de Mallorca is the island’s capital and the administrative centre of the Balearic Islands, and is a bustling, busy and cosmopolitan city. 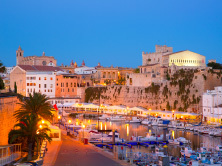 A Gothic cathedral and a medieval castle lend Palma historical interest and, with luxury shops crowing graceful boulevards and millionaire yachts packing the marina, the city is chic and classy. The quietest and most peaceful of the Balearics and ideal for visitors looking for relaxing days on the beach, a good meal, and an evening stroll rather than a hectic nightlife. 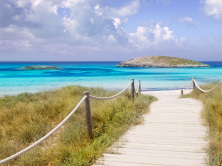 Best know for its beaches, this is ideal for family Menorca holidays. The Balearic cuisine you will encounter on your holidays to Mallorca is essentially Mediterranean. It makes full use of local herbs and of tomatoes, aubergines, courgettes, and peppers. These are all fried up together and form the basis for a variety of fish stews. Tumbet is a Mallorcan-style ratatouille of aubergines, potatoes and peppers in olive oil. Calderata de langosta has the local red lobster as its main ingredient. Calderata de peix is the same sort of hearty stew, using whatever came in with the catch, fish and seafood mixed together. You are certain to come across two local specialities on your Mallorca holidays: ensaimadas which are the local fluffy and light pastries and sobrasada which is a red spicy sausage pate. Sopas Mallorquinas are very thick soups with chunky bits of bread floating about in them and empanadillas are mini-pies and can be either sweet or savoury. Paella and gazpacho are on just about every restaurant menu in Mallorca [as they are everywhere else in Spain]. Calamares en su tinta is probably one of the oddest dishes you are likely to encounter, which is squid cut usually in rings and stewed in its own ink and is, of course, jet black. It is invariably served with white rice and most people find it delicious. There are plenty of opportunities for shopping on your Mallorca holidays. You will find a large selection of shops in the capital – Palma – from large department stores [for example El Corte Ingles] to small exclusive shops selling a wide range of local products. There are traditional crafts in Mallorca and visitors can visit places selling glass [glass blowing being a traditional craft] there are a few glass factories making objects of different designs and colours. Leather and footwear is another craft – visit Inca and Llucmajor. Ceramics have been a popular craft in Mallorca for centuries and pottery shops [or “olleries”] can be found around Mallorca – particular in the town of Portol. Pearl manufacture has been in Mallorca for more than a hundred years and the local factories are internationally acclaimed. Trips are available to the pearl factories in Manacor which you are able to purchase souvenirs of your holidays in Mallorca.